Time for a Drink for BeckyB! It was party time in Massachusetts. I would probably have been content to stay home and process bird pictures, but Garry felt we needed an airing. Also, he wanted to find out how his cochlear implant would handle a really large party. George Regan gives amazing parties. He’s kind of the best PR guys in the state, so if you’re trying to make it in politics or business or whatever, George is your guy. He’s also a remarkably nice person, too, with dogs and a lovely house on the water in Quincy. We are lucky to get annual invitations. We often don’t make it because it’s December which is usually busy — with bad weather. But this year, we made it. In addition to wanting to test out his new hearing, there was a friend who was going to be there who Garry wanted to see very much. He has been ill, so it has been a long time since we’ve spent time together — and George’s place is about as midway to our houses as you can get. They live in Bourne, on the Cape while we reside in Uxbridge, south-central of nowhere. 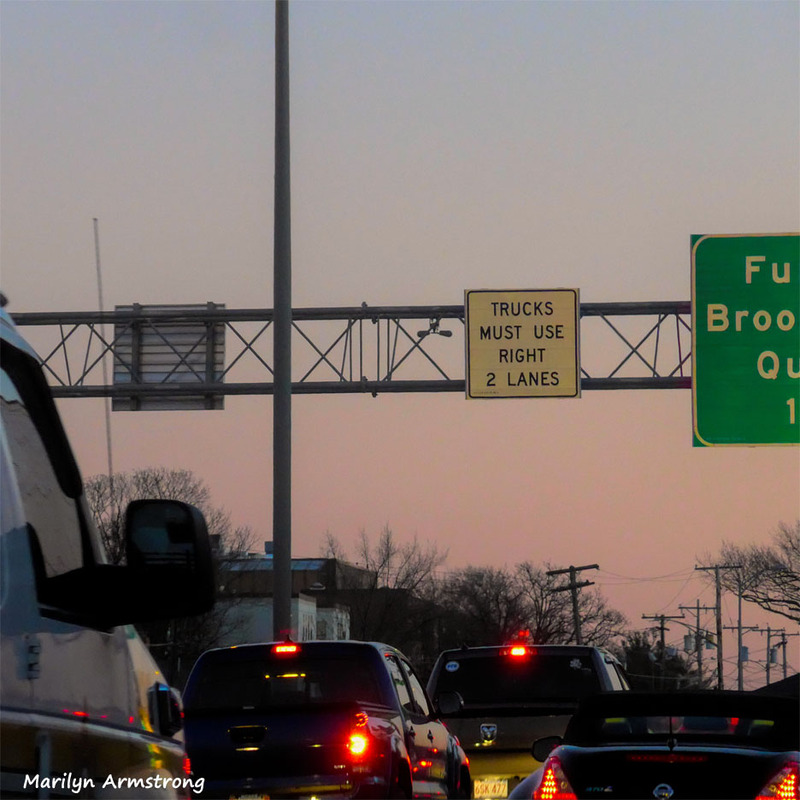 Quincy is one of those places which somehow is always in the middle of a traffic jam, so even though it should only be about an hour’s drive, it always takes at least two … and that’s on a Tuesday afternoon. I can only imagine the traffic on Saturday or Sunday, especially since they are on the road which goes to the stadium where the Patriots play. It’s close enough to Boston so over the years, it has become part and parcel of the Boston mega-traffic-jam, so we got stuck in it going there and coming back. We thought there had to be an accident or something along the way, but no accident that we found. Just traffic and a lot of it. We made it. Not only did we make it, but we didn’t get lost, which may be some kind of record for us. We often set out for events, but get so lost, we end up going home without ever going to the party. The moment we got there, I realized that wearing a black coat — Garry was wearing a gray one — were mistakes. In the “throw the coats in there” room were dozens of black and gray overcoats. We are nothing if not consistent. I keep intending to get something in some other color, but somehow, best intentions notwithstanding, my coats are always black or gray and I can never find them. 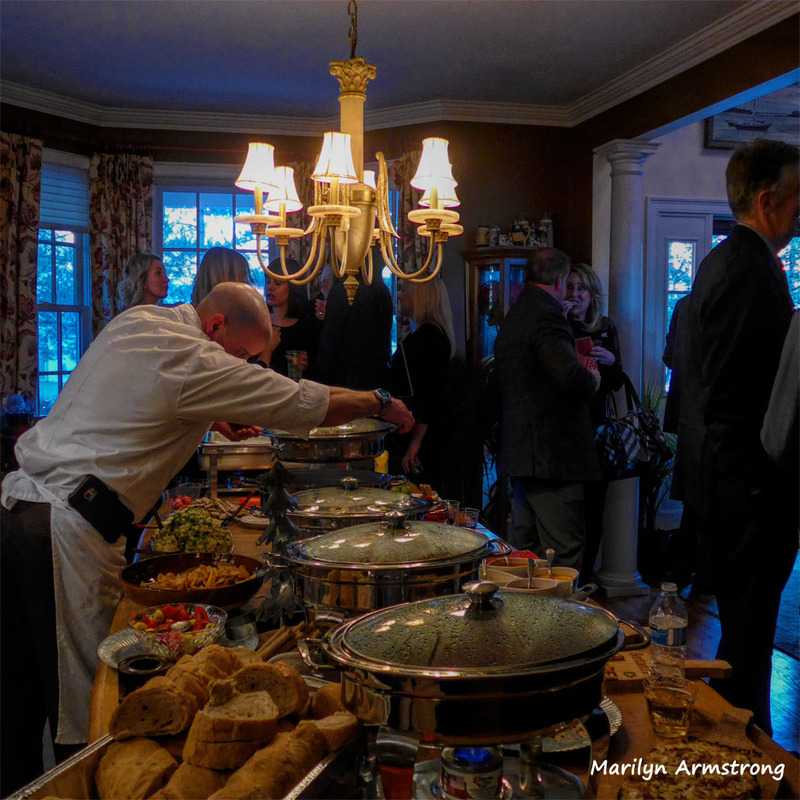 Dinner was constantly served – Always time to eat! There were a lot of people at the party. Garry eventually spotted three (other than the host) who he knew. I knew Garry. And the host. I used to know George’s beautiful Golden Retriever, but he passed a couple of years ago. During parties in the summer, the swimming pool belonged to the Golden. He used to swim around the pool trying to corral about 100 tennis balls. Then he would emerge from the pool, sopping wet, and shake. Not square, but the beautiful Golden Retriever needed remembering too. Almost everyone was all dressed except me because I don’t dress. It is one of the few privileges of age, so it made me laugh as guests ran in every direction as the dog shook off the pool water. Then he’d jump back into the pool because keeping track of hundreds of floating tennis balls is a pretty big job, but he was a dedicated retriever. You better believe that NO ONE complained about the water and the shaking retriever. George adored that dog and his two other pugs who were carried during the party because they were old and couldn’t manage in a house that crowded. And then we were homeward bound with about a million other cars. Now, we can say we have partied, celebrated, and hobnobbed. Oddly, I enjoyed the party. I met the conductor of the Boston Symphony Orchestra and a bunch of people I didn’t know. Ate pieces of hot pizza from Bertucci’s and took some interesting pictures. These days, that’s a party! Yeah, I avoid Quincy because it is in a perpetual traffic jam, though at 7 AM Sunday mornings on my way home from the Cape (if I decided not to take 495) I can fly right through. Meeting the conductor of the BSO is very cool! I’m not even sure who it is any more – I used to go all of the time when it was James Levine, but haven’t attended in years. Trent, I enjoyed the day – getting Marilyn and myself OUT of the house was celebratory in itself. We arrived “early” at the party (the drive in from Uxbridge wasn’t bad. Driving ANYWHERE from rural Uxbridge is a chore). The first goal: Seeing/hearing how I fared with the cochlear implant. There were wall to wall people with everyone drinking and talking. Trent, think the party scene from “Breakfast At Tiffany’s”) and you get the idea. Everything was VERY loud. I heard Marilyn cry “Garry!” behind me and I pivoted to meet someone. 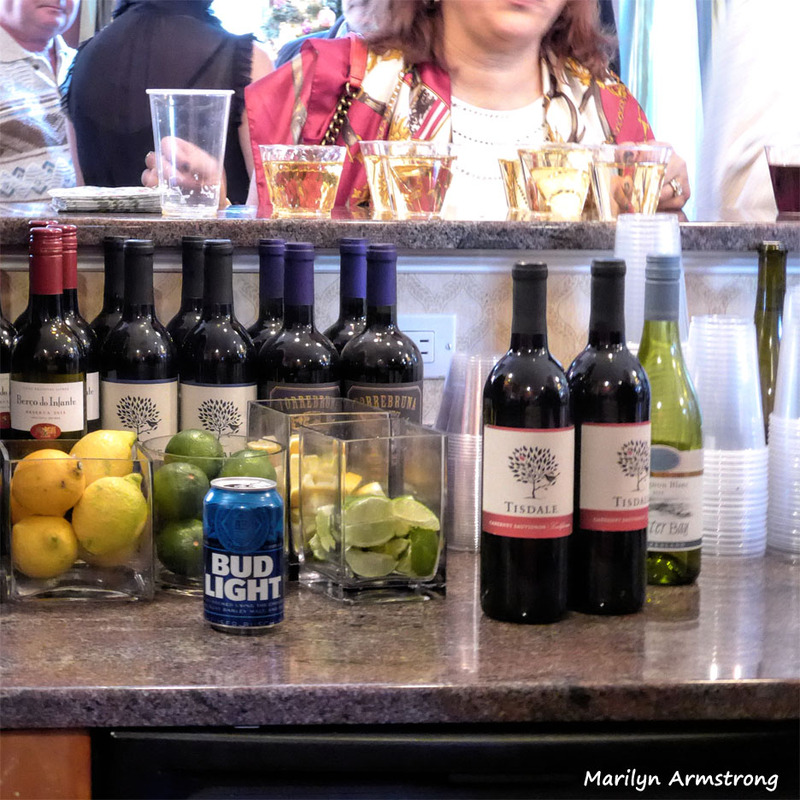 I was nursing a coke – my booze days are long gone. I was awaiting the arrival of a friend I hadn’t seen in a long time and he promised to attend the party. Time passed and the noise was beginning to get to me. Marilyn was also agreeable to move out. As we fished through piles of clothing for our overcoats, My friend and his wife arrived. Clothing searched put on hold as we greeted our old friends, chatted and Marilyn took pics of my friend and me. Two guys who used to be somebody — a legendary anchor and the reporter who’d been around since dinosaurs roamed through New England. The drive home was awful. We left just before 4pm. It was bumper to bumper — almost all the way home to Uxbridge. Rush hour plus accidents clogged everything up. 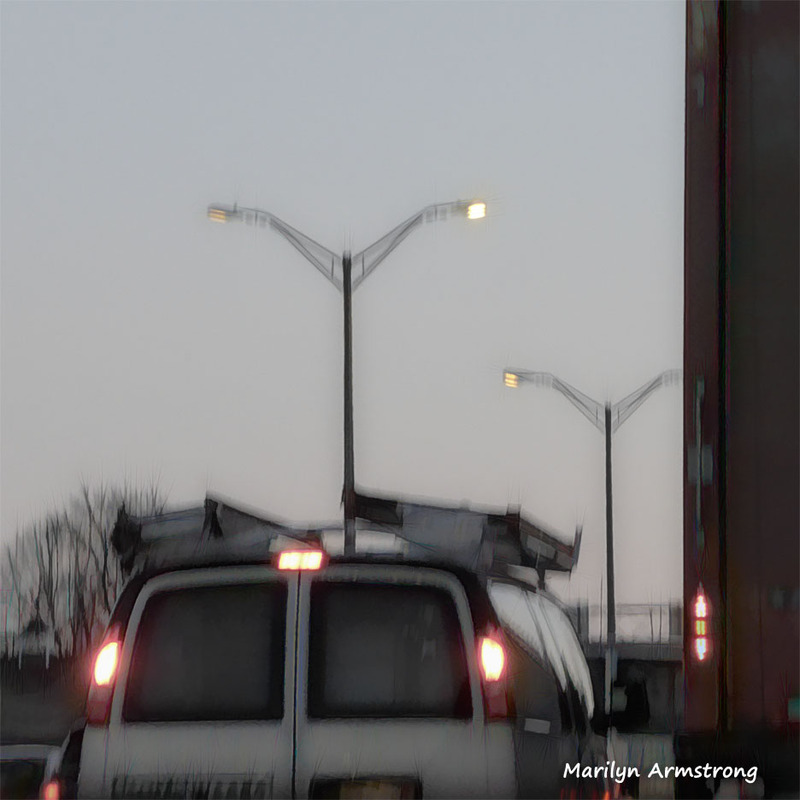 Marilyn kept the chatter going while taking pics of the sluggish traffic, My mind had roamed off to the Twilight Zone while paying attention to traffic. 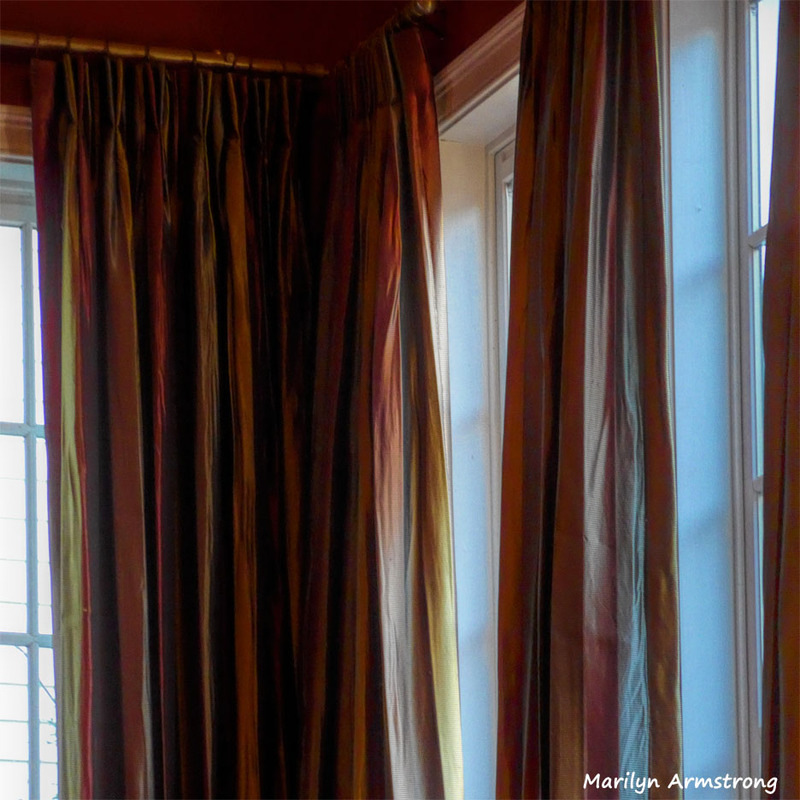 Marilyn and I were hungry and aching – from siting in the car for hours. Your body tenses up in those situations so I could my bones crackling as I moved towards the kitchen. We “feasted” on sandwiches and french fries — DEE-lish as we watched the Network News folies. We both were satisfied we’d accomplished two important things: We’d gotten OUT of the house and gone to a large party where my cochlear implant could be tested. We both relaxed with satisfaction as our bodies slowly relaxed and reprimanded us. It is always great to get out like that. I was wondering how it went for you with the implants. I have a hard time at those types of parties and often stand there with glazed over eyes as I try to follow 27 conversations at once while ignoring another 32…. I’m sure, not being used to that type of noise that it could be very tiring. I’m glad you didn’t miss your friend and had a chance to catch up. Yeah, three hours of heavy traffic does not sound fun. And I do bet the dogs were angry – ours always are when we get home late, though I think the cats are worse. Trent, I did my politically incorrect thing because that’s who I am. These days, I have to be careful with my big mouth — being judicious in certain gatherings. The party was ripe for me to do my schtick but I did it quietly with the other two fellows who were initially taken aback by me, then they relaxed and enjoyed what I was saying. I didn’t disrupt the proceedings. That would be rude. I don’t remember his name, probably because it was so loud in there, who could hear? Quincy is possibly the worst traffic area in the state, not counting Boston itself. When you are heading down through Boston, if you miss that exit, you can spend half a day trying to find a way back. We do have some terrible roads and worse drivers. Tickets to the symphony are outrageous. And we often would spend the night so we wouldn’t have to worry about driving, so an extra cost. Pretty much why we don’t go any more. And it is all live entertainment in Boston. My wife wanted to see Hamilton. She discovered it was cheaper to fly to Chicago, spend three nights, see the show and fly back than to drive in to Boston and see it. And the seats in Chicago were better! Trent, did “Hamilton” live up to all the hoopla for you? We still haven’t seen it. We still haven’t made it yet – we priced it, but other things came up. My wife -loves- the music and listens to it all of the time. It is good. It is very much rap based, but somehow still sounds like Broadway. I’m not sure how he pulled that off…. Trent, I am NOT a rap fan. I’m not a fan either, for the most part, but I do enjoy this. You might want to Google “Hamilton songs” and listen to one on youtube. Trent, thank you. So very kind. At least we actually got out of the house. No small thing, these days. I was thinking about that on our long voyage home. Yes, Martha. Nice to mix with adults and share conversation. Our host really puts on a swell party. Martha, it was. Felt like I was in the middle of a 50’s business holiday party. Lots of middle-aged guys telling war stories and hoary jokes. No judgement. Just fascination with being in a time warp. It was fun, just because it was a party. I missed the dogs. Our dogs would’ve changed the party’s tenor. The food tables would be in constant danger. Becky, our complaints aside. It was great to “get out and socialize”. It’s nice to know you can still mix in those kind of events. So often, I feel like we’re relics living in obscurity in a small town. More whiney than intended. Oh, I forgot how nice it was to dress up. I complimented myself, staring in the mirror, at how nicely I tied my tie. Marilyn also looked lovely. A very satisfactory feeling for both f us. We managed to dodge doggie hair as our kids followed us out. I could say same of MrB and myself, whenever we eventually go out we do enjoy ourselves and say we should do it more often!! Dawn, it was really a nice party. Again, a treat to get out of the house and socialize. Important to our mental health. We get out three or four times a year, though lately, there have been more funerals than parties. It was nice going somewhere where no one had (recently) died. Best coat color? Bright yellow or hot pink. Can’t miss them. WE have an orange car. Can’t miss that, either. I have a large pocketbook because I carry my camera with me all the time. I used to have a black wallet but I recently got a new one and purposely bought it in bright pink so zi could find easily in my bag. Thanks for sharing Marilyn, I feel like I went to the party too. We actually had our annual get together with the neighbours last night. Nice thing about that is you don’t have to drive and there’s no snow. It was nice just being out. And it is such a lovely home and he does such a nice job in making sure everyone has food and stuff to drink. Even not recognizing hardly anyone, it was still nice to be out. We are social animals and it does us good to get out. It does. I get a bit squirrelly being inside so much, but I feel better when we are out and about, at least a little bit. Looks like a great time was had by all! Yeah! It’s hard NOT to have a good time there. He makes it so easy to relax and talk to total strangers. It’s a gift. Truly a wonderful gift to have! Apparently I’m to wish you “Happy Holidays! !” I hope they are. It was bumper-to-bumper end to end. It should have been less than an hour, but anything which takes you through Quincy is slow going. That spread of eats looks very inviting. I’m not much of a socialite myself, but it usually works out OK. I would have missed the dogs as well since I’m one of those proverbial introverts who seeks out the resident pet when I’m forced to go to such a party. I do not hobnob with people I don’t know… can’t do it. And if the shaking wet dog annoyed the other guests, I’d have been tossing that tennis ball all day long! I think privately George was also more into the dogs than the people. And they clearly adored him, too.